Pikaia! is an interessing educational anime, aimed for kids mostly, but it's quite entertaining to say the least for adults aswell that are interessed in prehistoric life. Pretty much each episode is very short to say the least. It begins with a recap what happend last episode and it ends with some over Japanese dubbed footage from someone at the Smithsonian National Museum of Natural History from Washinton DC explaining a bit more about some trivia what you have seen in the episode. The story begins in the future when Earth itself is no longer inhabitable and the human race now lives in space, but a couple scientists that coined 'The Cambria Project' are trying to investigate the mid Cambrian biota to eventually find some clues how to restore Earth, so they send off two kids named Vince and Hanna temporarily back approximately 508 million years at the location what's now the famous Burgess Shale in Canada so they have to search for the animals to extract data that gets coined as 'The Lost Code'. I'm not really fond of the art-style. I don't really like all the Cambrian species are CGI models while the rest of the anime eyes much more appealing to say the least. But that's just me that I really don't like the combination of CGI and (computer) drawn anime. But it's amusing to see some Cambrian animals like the trilobite Olenoides sp. crawl around the seafloor and see the fearsome Anomalocaris sp. swim around in the Cambrian seas like how they are reconstructed in modern times. The voice acting and the other sound is done OK for a show like this. I didn't really had any isseus with the voice acting or the sound. It was just a bit wierd for me to see a caucasian man getting Japanese dubbed at the end of each episode and seeing yet another English Pokémon-like talking animal in a series. But besides that, I really don't have any mayor isseus soundwise. The charathers are OK I guess. There's not much to tell about the charathers since this anime is quite short, so we don't really have much charather development. The charather Pikaia however gives me way too much English dub Pokémon vibes, because it only can say it's name and it's apparently a hologram aswell. The charather however does remind me between the cross off a (friendly) anomalocarid and Manaphy from Pokémon. 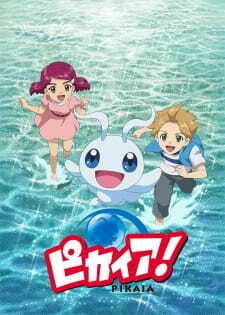 Even though this anime is aimed for kids, I did enjoyed it. Mainly that's because prehistoric animals are involved in this anime. Can I mention I wasn't familiar myself with the Cambrian worm like Ottoia sp.? So yes, I did enjoyed this anime. In overall, since I'm sort of a paleontologist myself as my job/hobby, I do recommend this anime if you don't really know anything about the strange Cambrian period to learn a bit more about several animals from this strange and yet most of uncertain time period in a entertaining way and can handle the childish approach of the show. I'm looking forward to watch the second season of this cute educational anime! Targeted at kids this educational anime does a fairly good job. There is always a thin line in educational anime between being interesting and becoming boring, but in Pikaia they were able to balance out the entertainment and educational parts. The story is pretty interesting, it often felt like being a fusion of futuristic elements, but also the past of Cambrian era. Mostly the pacing of the show was rater slow, except for their little but important adventure missions. There was usually at first a block with the actual pikaia episode (short recap & current episode) and after that the educational explanation block, in which they referred to the episode, the history/background behind it, but also to today's technology and research. In pikaia they were able to pique the interest from the episode for the follow-up educational part. After this, there always followed another short sequence (with simpler animation) in which the animated singers elfin' had a little platform to talk about the episode or the educational part. As I don't like such little short "talkshow-ish" sequences that much at the end of animations, I think it might have been great for the music cast to present themselves as well, so I don't mind that much anymore. Overall the music was really good, the opening suits the anime well, but also the background music was always well chosen. Good job on that! The animation quality was also on a good level and quite enjoyable. What I probably liked the most was the character design and the series composition of this series. It has been thought through and written loveable. The short anime episodes (about 15 minutes long) were a good choice as it stays easy digestible and relaxing to watch. I can imagine to watch this series after a stressed day after work/school. Don't expect deep hidden secrets, which have to be discovered by yourself, it is a series aimed at kids after all. Well done NHK!